Choosing the best reflex sight for your AR-15 offers a chance to take one of the world’s most effective close-range firearms and make it faster, more accurate, and better adapted to low-light shooting with a single upgrade. Aficionados cherish the AR platform for the thrill of dynamically firing strings of rounds while transitioning with rapid ease from one target to the next. Just as the word “reflex” replies on the proverbial tin, a quality sight should allow you to snap onto targets and pump out rounds as quickly and naturally as possible with minimal actual focus. Truly worthwhile reflex sights will perform as expected regardless of surrounding light conditions. Many shooters, though not all, prize a capable night-vision system as well. Of course, as with any electronic component, there is always a chance optics will fail unexpectedly and/or seemingly without reason. That’s why I don’t advise settling for reflex sights that don’t cowitness with the AR platform’s standard iron sights. Even the best-built optics can fail. In fact, any electronic device eventually gives up the ghost. Whether you plan for that reality or not determines what ensues if your peripheral malfunctions during use. Always get a first-hand feel for how the two play off one another before testing your sight under fire. The AR accommodates an extensive array of reflex sights, from products listed under $100 to premium optics whose prices stretch four places to the left of the decimal. That being said, I believe these four deliver, buck-for-buck, exactly the performance that most easily justifies their respective price tags. The Railway’s 100-percent aluminum body mounts effectively to both Picatinny and Weaver mounts, one of the more practical reasons top competitive shooters stake their reputations on C-More Systems’ standards for quality. 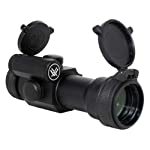 The Railway can mount virtually anywhere because the optic’s limitless elevation and windage adjustments make it possible to cater its targeting to any position needed. If you happen to shoot an AR-15 with a flat-top upper receiver, you won’t find many better-designed reflex sights for your needs than this small, thin optic to complement your weapon’s low profile. Doing so improves the rifle’s usability in urban situations prone to close-range shooting. You can choose from a number of sizes for its red dot ranging from two to 16 MOA in increments of two, as well as a wealth of colors to introduce an element of flashy personal style to the heads-up display’s rounded screen. It’s as fun to use as it is efficient and precise. The small, accurate, and easy-to-aim Trijicon Ruggedized Miniature Reflex (RMR) Sight displays the greatest accuracy when directed with both eyes open. Awkward as it might feel to some shooters, doing so mitigates the optic’s tiny field of view and ensures you see nothing but the amber dot as the RMR itself fades away. The RMR’s feathery weight and tiny stature keep the AR-15 itself light and convenient for use where rapid fire is a must in close quarters. At the same time, it can sustain incredible degrees of punishment. As far as its actual operations, the 3.25 MOA reticle seems the best of the sizes varying from one model to the next. Your eye can’t possibly miss the dot in close combat but should also pick it up without difficulty when snapping off shots out to 100 yards. Give it ample credit for convenience, as well. There just isn’t enough good I could say about the convenience of being able to switch the optic off or on and tweak brightness levels one-handed thanks to its simple buttons. Trijicon calibrated its two night vision and single daytime illumination settings at picture-perfect extremes, especially the lone ultra-bright level. An upfront concession: yes, the Vortex StrikeFire is slightly heavier and longer than I prefer for AR-platform optics. Still, I have so few complaints about the adjustable 4 MOA red dot and its night-vision compatibility at its two lowest brightness settings. Despite it being a bit “more” sight than I ordinarily care to screw onto my AR, it comes to bear fast and acquires targets easily thanks to its particularly wide 30mm objective lens. Having a reticle this bright makes it astoundingly easy to appreciate the sheer blood-pumping joy of rapid-fire shooting. It certainly helps that Vortex is notorious for top-notch moisture-proofing of their optics’ nitrogen-filled bodies and internal O-ring seals locking out debris and dust. Leupold’s hybrid of precise and efficient European design and durable American craftsmanship didn’t rise to become a gold-standard in sporting optics thanks to the company’s best minds resting on their laurels. 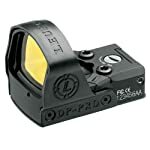 On the contrary, the makers of the acclaimed DeltaPoint red-dot sight took a long look at their prove-effective blueprint and added an especially handy manual brightness adjustment to the incredibly compact DeltaPoint 2 for users who sometimes prefer some slightly finer adjustment to their reticles. Thankfully, the DeltaPoint 2 also carries forward easily one of the most impressively dynamic features of the original model: motion-sensor technology that automatically and intuitively adjusts to the environment’s brightness upon activating after picking up movement nearby. When it comes to a platform that prides itself on coming to bear fast, acquiring targets as fast as the human eye allows, aiming true, and firing fast, what more could any tactical or competitive AR-15 shooter ask of a sight than the capacity to do a little “thinking” for itself? Shooting is as individual a skill as there could ever be. That’s why firearms and their peripherals are often so modular: the best reflex sight for your AR-15 is the one that allows you to mould it to your natural mechanics, tendencies, and even physical limitations. That’s what I love so much about these four in particular. Each of these lets the shooter make the sight his own, as much an extension of the senses as the weapon itself. No less than how it should always be with any weapon in one’s hands.